Sales Just Slumped: Will General Motors Cut Its 4.5% Dividend? GM had a tough third quarter in the U.S. and China. Is the dividend still safe? 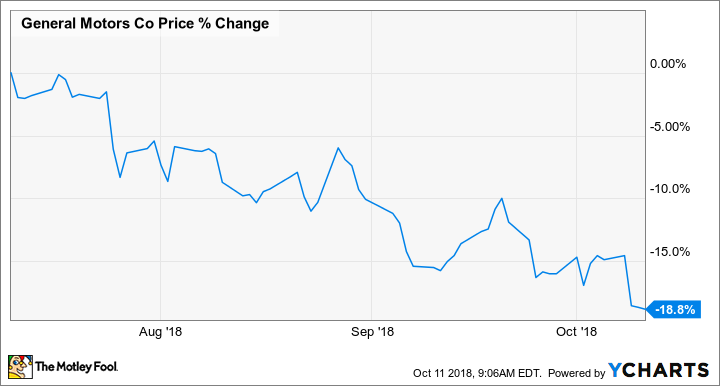 General Motors' (NYSE:GM) stock has had a rough few months: In the last three months, GM's share price has fallen more than 18%, hitting lows not seen in over a year. That share price decline has pushed GM's dividend yield up to around 4.5%, drawing interest from income-minded investors. But whenever we find a high-yielding dividend stock, we have to ask: Can this company sustain its dividend payments, or is a cut likely? If GM can sustain its dividend, it could be an intriguing buy at current levels. But if it can't, then income-seeking investors would be wise to steer clear. Which is it? Data sources: Thomson Reuters and General Motors. "Last increase" is the date the increase was declared, not the date it was first paid. Payout ratio is calculated from 2017 full-year figures, and the calculation excludes the effects of a $7.3 billion one-time non-cash tax adjustment. GM is in the process of rolling out all-new 2019 versions of its GMC Sierra and Chevrolet Silverado pickups. Supplies were tight in the third quarter, which hurt GM's overall U.S. sales total. Image source: General Motors. GM data by YCharts. Chart shows GM's price movement as a percentage change for three months through market close on Oct. 10. It's not too hard to see why investors have been growing concerned about General Motors. For starters, GM posted double-digit-percentage sales declines in both the U.S. and China -- the world's two largest markets for new vehicles -- in the third quarter. That raises some big concerns about GM's profitability. Automakers have high fixed costs; a sales decline that seems incremental can have an outsize impact on margins and profits. That in turn should raise concerns about the dividend: If GM's profits get squeezed -- or disappear entirely for a few quarters -- because of declining sales, isn't a dividend cut likely? First, let's examine why GM's sales were down in the U.S. and China in the third quarter. In the United States, there are a few different things going on. First, it's a tough comparison: A hurricane gave GM's sales a boost in the third quarter of 2017, as people who had lost vehicles to floods rushed to replace them. There was a powerful hurricane during this year's third quarter, too, but it arrived later -- in time to hurt sales (because nobody in the affected region was going car-shopping), but not in time for GM to see a lift from replacement sales. Second, GM is in the midst of transitioning to all-new versions of its best-sellers, its full-size Chevrolet Silverado and GMC Sierra pickups. The new trucks should be more profitable than the outgoing models, but right now, GM's truck inventories are tight. Dealers have sold down the (old) 2018 pickups, but supplies of the new ones are still very thin. Sales of the Silverado and Sierra were down a combined 12.5% in the third quarter, or 26,276 vehicles. That alone accounts for about 30% of GM's year-over-year sales decline in the quarter. In China, the story is different. The overall new-car market in China is slowing, as consumers have become more cautious about spending in light of economic and trade pressures, and GM is not alone in feeling the effects of that slowdown. GM is also in the midst of an engine changeover affecting several big-selling Buick models. The new engines are small, advanced fuel-efficient three-cylinder units, and while three-cylinder auto engines have been proven in other parts of the world, they're unfamiliar to Chinese consumers. So far, buyers have been skeptical of the new power plants -- a situation that will probably change as GM does more marketing and education around the new engine, but one that hurt early sales of affected vehicles. Chinese buyers have reportedly been skeptical of 2 new 3-cylinder engines recently introduced by GM. Image source: General Motors. At least some of the reasons for GM's third-quarter sales decline are likely to have a short-term effect. The markets are softening, and that's a concern -- but a significant profit squeeze doesn't yet seem likely. And in any event, GM has said that it's prepared to sustain dividends through a recession. Is GM's dividend sustainable if profits get squeezed? The upshot: Is GM stock a good bet for income? Some of the reasons GM's sales were down in the third quarter were short-term effects that will likely pass within a quarter or two. While the new-car markets in the U.S. and China may be weakening, sales are still far above the levels at which GM would likely slip to losses. That said, a recession is inevitable sooner or later. GM is prepared to sustain its dividend payments through a recession, at least for as long as its (hefty) cash hoard holds out. Its cash hoard is more than enough to see it through a typical recession, and likely through a severe one. Long story short: GM isn't likely to cut its dividend, even if a recession arrives.